Are you seeking to get in shape or stay in shape before, during, and after a pregnancy? Pilates is fast becoming one of the top workout routines for women who are planning to have a baby. 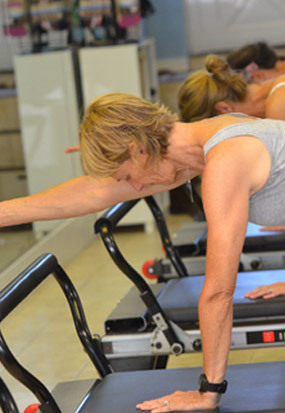 The core strength that a Pilates class works to build can mean stronger abdominals, back muscles, and pelvic floor, to support a comfortable pregnancy and enable a faster recovery. Of course, as with any workout routine, you should check with your doctor first. In most cases, a doctor will find no problem with you adopting a Pilates routine. Most Pilates exercises can be modified and adapted to support each stage of your pregnancy. Here are a few tips if you want to make Pilates part of your own pregnancy plan! Make sure your Pilates instructor is experienced in teaching pre-natal Pilates. Even if you are already a Pilates practitioner, having a qualified instructor guiding and monitoring you is best since pregnancy means certain moves should be avoided and others modified. Ensure that you have proper nutrition and hydration. Exercise should always go in tandem with a realistic, healthy diet plan. If you work out when you aren’t sufficiently nourished or hydrated, you can end up dizzy, nauseous, headachy, or even experience contractions or spotting. Just because Pilates is “low impact” doesn’t mean it’s “no impact”! Pay attention to your body. If your energy levels are low, make sure your blood pressure and blood sugar are in line before starting a session. If your energy doesn’t pick up after ten minutes or so, call it a day. Sometimes you just don’t need to push, and if the endorphins don’t start to show up by that point, you are probably overdoing it. Be careful as your body changes. A woman’s center of gravity shifts during pregnancy, and even simple things like getting up and down from the mat, on and off the reformer, or leaning over can cause you to overbalance. Your instructor should help you monitor your balance and keep your routine changing to accommodate your body’s capabilities. Gradually phase out certain exercises. After the first trimester, side-kicks will be out, as will any exercise that requires lifting your feet over your head. Instead, focus on gentle, flexible pelvic and core strengthening exercises that you can do while sitting or standing. If your doctor okays it, you could continue doing Pilates in some form or another right up until delivery. You can also jump back in as soon as your doctor approves after the birth, to regain your toned body and feel great in your new mom body!